This impressive image of the open cluster known as Trumpler 14 was obtained with the Multi-conjugate Adaptive optics Demonstrator (MAD) mounted on ESO’s Very Large Telescope. The cluster resides at the outskirts of the central region of the Carina Nebula, located some 8000 light-years away towards the constellation of Carina (the Keel). The life of a large family of stars has been revealed in stunningdetail by a technique that removes the blurring effects of Earth?s atmosphere. The young star cluster Trumpler 14 can be seen clearly inthe new image taken by the adaptive optics system on the European SouthernObservatory's Very Large Telescope (VLT). The snapshot represents the largest patch of sky yet to beimaged with adaptive optics. The technique counteracts interference from Earth'satmosphere by making swift, real-time changes in the shape of a telescope'smirror during observations. At less than 1 million years old, Trumpler 14 is theyoungest cluster of stars in the CarinaNebula (also noted for hosting EtaCarinae ? one of the wildest and most massive stars in our galaxy). 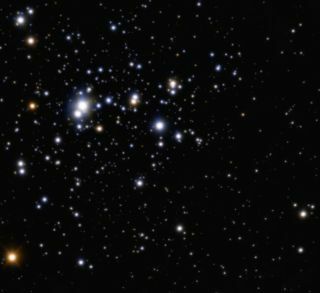 Thelarge open cluster is located about 8,000 light-years away from Earth. The high quality of the VLT image showed astronomers thatnot only is Trumpler 14 the youngest cluster in the nebula ? with a newlyrefined age estimate of just 500,000 years ? but also one of the most populousstar clusters within the nebula. The astronomers who observed the cluster counted about 2,000stars in their image spanning the entirerange of stellar sizes, from less thanone-tenth the mass of our sun up to a factor of several tens of times its mass.All of these stars are packed into a space just 6 light-years across ? lessthan the distance between the sun and its nearest stellar neighbor. The most prominent star in the cluster is the supergiant HD93129A, one of the most luminous stars in the Milky Way galaxy. This titan hasan estimated mass of about 80 times that of the sun and is approximately 2.5million times brighter. It is part of a stellar pair? ?or binary star? ?withanother bright, massive star. Astronomers expect the adaptive optics technique used tomake the Trumpler 14 image will be crucial to the next generation of largetelescopes.